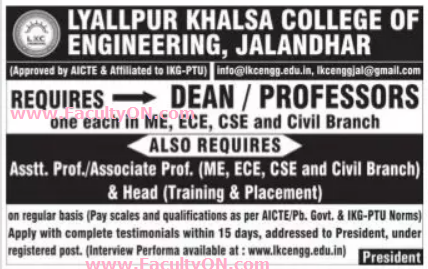 Lyallpur Khalsa College of Engineering, Jalandhar has advertised in the TRIBUNE newspaper for recruitment of Teaching Faculty- Professor / Associate Professor / Assistant Professor / Dean Plus Non-Faculty jobs vacancies. Interested and eligible job aspirants are requested to apply within 15 days from 23rd May 2018. Check out further more details below. About College: The Lyallpur Khalsa College of Engineering got established in 2013 under the aegis of Khalsa College Lyallpur Education Charitable Trust. The Institute is located in the heart of city on a prime piece of land. It was established with an aim to impart engineering education to the students to make them competent, motivated engineers and scientists. How to Apply: Interested and eligible candidates are requested to send CV, copies of certificates and recent PP size photo to the postal address provided here through registered post.